Mazda Motor Corporation will exhibit two concept models at the 2017 Tokyo Motor Show, one that heralds the company's next-generation products and another that embodies the direction of the company's next-generation design. Mazda will also display the SKYACTIV-X next-generation gasoline engine as a technology exhibit at the show, which runs from Oct. 28 through Nov. 5. Mazda's theme for this year's show – Mazda is committed to enriching people's lives through "Celebrate Driving." – indicates the company's determination to continue offering cars that celebrate the driving experience, enrich lives and build a strong bond with customers. The product concept model, a compact hatchback that fuses next-generation technology and design, will make its world premiere at the show. It adopts SKYACTIV-Vehicle Architecture, next-generation technologies that apply a human-centered design philosophy for optimal functionality, and is powered by the SKYACTIV-X, set to become the world's first commercial gasoline engine to use compression ignition.1 Dynamic performance has been dramatically refined and next-generation design condensed to create Mazda's ideal compact hatchback. The design vision model embodies the concepts that will define the next generation of Mazda design, resulting in a more profound expression of the globally-acclaimed KODO design language Mazda debuted on the Mazda CX-5 in 2012. The Mazda CX-8, a new three-row crossover SUV that goes on sale in Japan in December, will also be on display at the show. The company's flagship SUV in Japan, it features sophisticated styling and comfortable seating in all three rows. Major upgrades to the SKYACTIV-D 2.2 clean diesel engine increase torque and power for composed performance. A special edition Mazda Roadster (MX-5) Red Top featuring a dark cherry red canopy and auburn Nappa leather upholstery will be exhibited. "In August, we announced our Sustainable Zoom-Zoom 2030 long-term vision for technology development, setting out how Mazda hopes to use driving pleasure, the fundamental appeal of the automobile, to help solve issues facing people, the earth and society. The vision commits Mazda to make substantive cuts in CO2 emissions, and we believe the best way to achieve this is to reduce emissions under real-world conditions while offering a mix of combustion engines and electrification technologies in consideration of each region's energy situation and energy mix," said Masamichi Kogai, Mazda's Representative Director, President and CEO. "Our stand this year marks the beginning of a new era for Mazda. 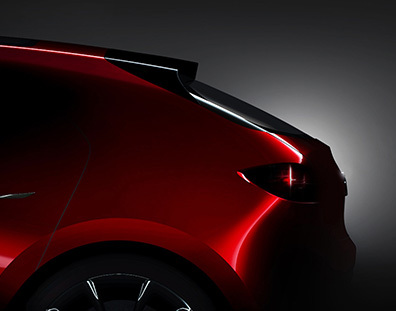 We will showcase a concept model with the design and technologies that will define a whole new generation of Mazda cars. Among them is SKYACTIV-X, a gasoline engine that realizes a long-held dream of the global automotive industry."